Outfielder Chip Ambres played eleven seasons of professional baseball, including three years in the major leagues. His best season was 2005, when he hit .241 with 4 HR and 9 RBI in 53 games for the Royals. Now a baseball instructor at Chip Ambres Youth Sports and Marucci Baseball USA in Houston, he kindly answered my questions about baseball cards. "Regarding the baseball cards, it was one of my high points in playing professional baseball. As a kid I collected baseball cards and still to this day I have those same cards. When I received my cards for the first time I was in spring training in my hotel in Cocoa Beach, Florida autographing a bundle of cards. The 1999 Bowman rookie card of me robbing a home run is my favorite, and still to this day I have mail coming in for me to autograph cards. It's a very humbling experience and that's one of the things that keeps me connected to the game of baseball!" 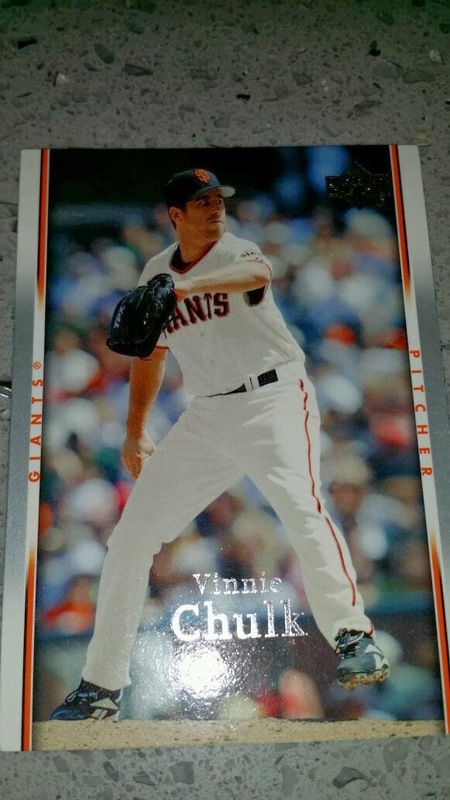 Vinnie Chulk pitched eight seasons in the major leagues for the Blue Jays, Giants, Indians and Brewers. His best season was 2007, when he went 5-4 with a 3.57 ERA for San Francisco. Now a real estate professional at Team Chulk & Maduro, which specializes in luxury real estate for professional athletes, he kindly answered my questions about baseball cards. I collected cards as a youngster and still have most of them. Ken Griffey rookie card is probably my favorite." I have three cards of Dave Berg. This one is from 2003 Topps. Playing career: Infielder Dave Berg played for the Marlins and Blue Jays from 1998 to 2004. In 582 games, he hit .269 with 21 HR and 163 RBI. Where he is now: Manager of the Greensboro Grasshoppers in the Marlins organization. Google Autocomplete results: He is sixth when you type Dave Be, between Dave Bennett, a clarinetist, and Dave Bernath, an EVP at Comedy Central. There are no references to the ballplayer on the first page of results; most refer to the Mad Magazine cartoonist. Coming up next: The next profile will be Mike Berger. I have fourteen cards of Bruce Berenyi. This one is from 1983 Fleer. Playing career: Bruce Berenyi was a decent starting pitcher for the Reds and Mets in the early 1980s. In 142 games he went 44-55 with a 4.03 ERA. Unfortunately for Berenyi, he had his best years with some bad Reds teams, and when he got traded to a good team, the Mets, he suffered rotator cuff injuries that ended up killing his career. A fuller account of his career can be found at the 1983 Topps blog. Where he is now: He is a golf professional in New Hampshire, and also plays in a classic rock band called Rusty Loadz with relatives and childhood friends from Ohio. Interesting facts: His uncle, Ned Garvin, won 129 games for the St. Louis Browns, Detroit Tigers, KC A’s and LA Angels from 1948 to 1961. After his playing career he used the insurance money from his arm injuries to buy a condo with cash. He then declared bankruptcy, taking advantage of a Florida law that allowed bankruptcy filers to keep all of the equity in their home. While living in Florida, Berenyi apparently came out as homosexual and played for a gay softball team. However, this was only reported on the league’s website, which has been down for over a decade, and has not been confirmed anywhere else. Google Autocomplete results: He is fourth when you type Bruce Bere, between Bruce Beresford-Resman, a TV producer, and Bruce Beresford IMDB, referring to a film director. There do not appear to be any other prominent Bruce Berenyis. Coming up next: The next profile will be Dave Berg. I have 55 cards of Juan Berenguer. This one is from 1985 Fleer. Playing career: Juan Berenguer pitched fifteen years in the major leagues. His career started out roughly. From 1978 to 1980 he appeared in sixteen games with the Mets and put up a 4.75 ERA. In 1981 he split the strike-shortened season between Kansas City and Toronto, leading the American League in losses, going 2-13. However, he found success in Detroit, where he was the fourth starter on the 1984 World Champion team. He struggled in 1985, however, and was traded to the Giants, who put him in the bullpen, where he found greater success. He was a key bullpen piece for the World Champion 1987 Twins and saved 17 games in 1991 for the Braves, helping lead them in their surprise move from last place to first. He was known as “Senor Smoke” for his blazing fastball, and his lack of other pitches helps explain why he was a more effective reliever than starter. Interesting facts: In the mid-1980s every sports champion had to release a music video. After the Twins won the 1987 World Series, the “Berenguer Boogie” was filmed and released. His son Chris Berenguer played pro hockey in the Flyers and Devils organizations. His nephew Uri Berenguer-Ramos is a play-by-play announcer for the Red Sox. My memories: I don’t remember the “Berenguer Boogie” but I do remember him being a solid middle reliever for many years. Where he is now: Sales Consultant at Freeway Ford in Bloomington, MN. Google Autocomplete results: He is eighth when you type Juan Be, between Juan Bernat, a Spanish soccer player, and Juan Beltre, a graphic designer. Another prominent Juan Berenguer is an insurance agent in Miami. Coming up next: The next profile will be Bruce Berenyi. I have 30 cards of Jason Bere. This one is from 1995 Fleer. Playing career: Jason Bere came up with the White Sox in 1993 and immediately looked like one of the game’s bright young stars, going 12-5 with a 3.47 ERA, helping Chicago make the playoffs for the first time in a decade. In 1994 he kept up the pace, going 12-2 with a 3.81 ERA in the strike-shortened season. However, the wheels came off in spectacular fashion in 1995, when he went 8-15 with an astronomical 7.19 ERA in 27 starts. Bere stayed in baseball through 2003, but injuries and ineffectiveness limited him to just three seasons of 20 starts in that span, and only one with an ERA lower than 4.50. In 1993 and 1994, he went 24-7 with a 3.64 ERA. From 1995 to 2003, he went 47-58 with a 5.65 ERA. Where he is now: Special Assistant to the General Manager of the Cleveland Indians. My memories: I remember him as a highly touted rookie with the White Sox. I hadn’t realized how quickly and thoroughly his career went off the rails. Google Autocomplete results: He is third when you type Jason Bere, between Jason Beren, a Director at Deutsche Bank, and Jason Berenson, Director of Engineering at PINS. There do not appear to be any other prominent Jason Beres. Coming up next: The next profile will be Juan Berenguer. I have one card of Jeff Berblinger, from 1994 Fleer Excel. Playing career: Second baseman Jeff Berblinger played eight seasons of professional baseball, mostly in the Cardinals organization. He played in seven games for the St. Louis Cardinals in 1997. He went 0 for 5 but scored a run. Where he is now: A youth baseball coach in Kansas. Google Autocomplete results: He is first when you type Jeff Berb, ahead of Joe Birbiglia, a writer. There do not appear to be any other prominent Jeff Berblingers. Coming up next: The next profile will be Jason Bere. I have 62 cards of Todd Benzinger. This one is from 1988 Classic Blue. Playing career: First baseman Todd Benzinger came up with the Red Sox in 1987, having a solid rookie season. He was the regular first baseman for the Red Sox in 1988 and Reds in 1989 and 1990, but did not hit well enough to be a regular major league first baseman. He bounced around as a backup for several other teams (Royals, Dodgers, Giants) through 1995. My memories: I remember him as part of a big Red Sox rookie class that included Ellis Burks and Sam Horn in 1987. I also remember watching him catch the last out of the 1990 World Series. Where he is now: He does some youth coaching an minor league broadcasting in Dayton, OH. Google Autocomplete results: He is fifth when you type Todd Ben, between Todd Bentley 2013 and Todd Bentley Scandal, both of which refer to a controversial minister. There do not appear to be any other prominent Todd Benzingers. Coming up next: The next profile will be Jeff Berblinger. Want to buy a former pro baseball player's card collection? Two years ago I interviewed former Mets minor leaguer Jason Felice. Jason contacted me this week because he is interested in selling his card collection. He has about a hundred cards from the early 1970s, the best of which can be seen in the scan below. As you can see he has some pretty good vintage cards. He also has hundreds of cards from his playing era (1980s). If you are interested in buying all or part of his collection leave a comment or send me an email and I'll get him in touch with you. Shane Youman has pitched professionally since 2002. In 2006 and 2007, he pitched in the major leagues for the Pittsburgh Pirates. He is currently a pitcher for the Lotte Giants in Korea, coming off a season in which he went 13-4 with a 3.54 ERA. He kindly answered my questions about baseball cards. "The only story I have deals with a card of myself. The picture was taken in 2006. Not many people know this, but it was a photo of me with a crazy look on my face as I was watching the ball sail out of the park. I remember that moment because I knew as soon as I threw the pitch, that ball would be lost. As for a favorite card, I would have to say this old card I found of Ray Searage back in the day when he was pitching. He had that thick 'stache he still wears today, and he happens to be my favorite pitching coach. I don't collect baseball cards, but I have a few lying around here and there." Thanks! Here is a card of him from my collection, from 2007 Topps. I have 26 cards of Kris Benson. This one is from 2000 Impact. Playing career: Kris Benson was the number one pick in the 1996 draft, but injuries and inconsistency prevented him from fully realizing the promise of being drafted first overall. He did win 70 games in nine seasons for the Pirates, Mets, Orioles, Rangers and Diamondbacks. His best season was 2005, when he went 10-8 with a 4.13 ERA for the Mets. A fuller account of his career can be found at bdj610’s Topps Baseball Card Blog. Where he is now: An independent entrepreneur focused on wealth and business management. Interesting facts: Best known for his wife, Anna, who became a bigger celebrity than her husband in New York. She was known for her wild and provocative behavior, such as threatening to sleep with the entire Mets team if Kris had an affair. The Bensons did do positive things in the spotlight as well, most notably starting a charity for first responders called “Benson’s Battalion” that was praised in the Congressional Record. Kris filed for divorce in 2012, and in July of 2013 Anna was arrested after breaking into Kris’s house, armed and demanding $30,000. She spent four months in jail, then pleaded guilty to aggravated assault and gun possession and was sentenced to fifteen years of probation and three months of therapy. Google Autocomplete results: He is second when you type Kris B, between Kris Bryant, the Cubs’ first round draft choice (second overall) last year, and Kris Bowers, a musician. Another prominent Kris Benson is the Principal of the Isaacs Early Childhood School in Plano, TX. Coming up next: The next profile will be Todd Benzinger. I have one card of Joe Benson, from 2012 Topps Heritage. Playing career: Outfielder Joe Benson was the second round draft pick of the Twins in 2006, and he slowly rose through the organization, playing 21 games at the major league level in 2011. However, the last two years he has struggled mightily at AA and AAA just to reach the Mendoza Line. Where he is now: Signed with the Marlins organization for 2014. Google Autocomplete results: He is seventh when you type Joe Ben, between Joe Bendik, an MLS soccer player, and Joe Benigno Twitter, referring to a sports-talk-radio host. Another prominent Joe Benson is a classic rock DJ. Coming up next: The next profile will be Kris Benson. I have three cards of Joaquin Benoit. This one is from 2007 Upper Deck. Playing career: Joaquin Benoit came up with the Rangers in 2001 and pitched eight mostly undistinguished years with Texas, first as a starter, then as a reliever. He missed all of 2009 due to rotator cuff surgery, then had a great season with Tampa Bay as a middle reliever. He then went to Detroit where he had three very solid seasons as a set-up man and, in 2013, as a closer with 24 saves. Where he is now: He signed with the Padres for 2014 to be their main set-up man. My memories: He’s a familiar name from being in the league for so long but no specific memories. Google Autocomplete results: He is second when you type Joaq, between Joaquin Phoenix and Joaquin Phoenix Her, which refer to an actor and his movie. There do not appear to be any other prominent Joaquin Benoits. Coming up next: The next profile will be Joe Benson. 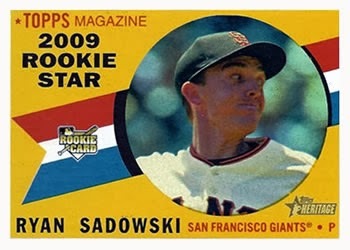 Ryan Sadowski was the Giants' twelfth round pick in 2003, and by 2009 he made the major leagues, going 2-4 with a 4.45 ERA in six starts. Since 2010 he has pitched in Korea. He kindly answered my questions about baseball cards. "I was never a big prospect. My only Topps and Bowman cards were in 2009. My older brother Adam has collected every type of those cards. I collect '33 Goudey's. I think it is the greatest set. Baseball became the game it is today because of the players in that set." Anthony Slama pitched in the Twins organization from 2007 to 2013, going 15-14 with a 2.46 ERA. He pitched in the major leagues for the Twins in 2010 and 2011, going 0-1 with a 5.14 ERA. Now an instructor at RedLine Athletics in Lake Forest, CA, he kindly answered my questions about baseball cards. "I live in Orange County near Anaheim Stadium, and I once saw Roger Clemens inside a sports store near my house with my dad. My dad pointed him out to me inside the store and I got excited because I watched him pitch many times. It was probably around "94, when he was with Boston. I couldn't believe my luck because I knew I happened to have one of his cards in a book in the car. I ran out and grabbed it and came in just as Mr. Clemens was checking out. He was buying a box of baseballs to sign and donate to charity. I asked him to sign the card, which he did. In all my excitement, I don't remember anything he said to me, but I remember the card and still have it today. Not many baseball cards of my own circulating out there (you seem to need more than an espresso in the big leagues to have a baseball card) but one that I think is pretty cool is the USA Futures Game card of me that has a piece of my jersey on it. I bought it myself off of eBay, and was extra pumped up because the picture they used prominently displays the mustache I was cultivating at that time. My favorite baseball card when I was a kid was a Bo Jackson/Nolan Ryan duo card that said Nolan Knows Bo. I thought it was awesome, and I liked the idea that those two guys could have been buddies. I remember my dad telling me he had Willie Mays and Mickey Mantle cards aplenty when he was a kid, but threw them out thinking they were just cards. I remember thinking, well I'm much more business savvy than that! I'm holding onto these things as an investment! We all thought we were going to get rich by encasing our 1986 Harold Reynolds Rookie Card in a lucite case, as if the industry had to continue the way it was. Unfortunately, the market didn't work out that way, but I think the market has room to re-build and the bubble can grow once again. I don't currently collect baseball cards, but I think it's a safe and interesting hobby for others and I respect the organizational skill it takes to do it well." Second baseman Brian Dinkelman has played in the Twins organization since 2006. In 2011 he played in 23 games at the major league level, hitting .301. He kindly answered my questions about baseball cards. "I used to collect cards when I was younger in grade school but I have not collected them for years. I have not collected any cards while playing but wish I would have of players I played with in the past." I have one card of Jose Bennett, from 1987 ProCards. Playing career: Outfielder Jose Bennett played in the Mariners organization in 1986 and 1987. In 111 games he hit .254 with 9 HR and 54 RBI. Where he is now: Anyone know where Jose Bennett is now? Google Autocomplete results: He is first when you type Jose Benn, ahead of Jose Bennell, a nurse in London. The first entry when you Google Jose Bennett is not the ballplayer but a Paper & Forest Products Professional. Coming up next: The next profile will be Joaquin Benoit. I have one card of Jeff Bennett, from 2004 SP Prospects. Playing career: Jeff Bennett has pitched professionally since 1998, including parts of four seasons in the major leagues with Milwaukee, Atlanta and Tampa Bay. In 179 major league games, he is 8-17 with 3 saves and a 4.30 ERA. Where he is now: In 2013 he pitched at Lancaster in the Atlantic League, going 1-1 with a 3.12 ERA in six games, and at Tabasco in the Mexican League, going 8-3 with 6 saves and a 4.15 ERA in 25 games. Interesting facts: On June 25, 2009, Bennett was struggling in a game against the Yankees, and punched a door in between innings. He broke a bone in hand, and, embarrassed about what he had done, pushed the protruding bone back into place and went back out to pitch, giving up a home run to Nick Swisher. My memories: I don’t remember Bennett at all, but I do remember that game on my birthday, which was part of a series that helped turn the Yankees’ season around in 2009 and propelled them to the World Championship. Google Autocomplete results: He is first when you type Jeff Ben, ahead of Jeff Benjamin, the General Counsel of Avon. There are no mentions of the ballplayer on the first page of Google results; most refer to a voice-over actor. Coming up next: The next profile will be Jose Bennett. I have four cards of Gary Bennett. This one is from 2007 Upper Deck. Playing career: Gary Bennett played thirteen years in the major leagues as a backup catcher for eight different teams, mostly the Phillies, Rockies and Cardinals. He was a member of the world champion 2006 Cardinals. He was on the postseason roster but did not play in the World Series. For his career he hit .241 with 22 HR and 192 RBI. Where he is now: He has been very active since his baseball retirement. He is a Cardinals analyst for Fox Sports Midwest, an orthopedics salesman at Smith & Nephew, a catching instructor at Slammers Illinois, and a partner at Torresin Builders. My memories: I remember him being on that 2006 Cardinal team, but nothing specific. Interesting facts: He admitted to HGH use after being named in the Mitchell report. Google Autocomplete results: He is fourth when you type Gary Ben, between Gary Bennett Duke, referring to a professor of psychology and neuroscience, and Gary Benenson, a professor of mechanical engineering at City College. Another prominent Gary Bennett is a country music guitarist. Coming up next: The next profile will be Jeff Bennett. I have one card of Doug Bennett, from 1991 Stadium Club Dome. Playing career: Doug Bennett was the fifth round draft pick of the Dodgers in 1991, and his career started out with great promise. In 16 minor league games (14 starts), he went 5-5 with a 3.22 ERA. However, shoulder injuries ended his career in 1992 and he never pitched professionally again. Where he is now: Sales Specialist at pest control company Presto-X in Springfield, MO. Google Autocomplete results: He is first when you type Doug Benn, ahead of Doug Bennett QBE, referring to the company’s head of Program Business. There are no references to the ballplayer on the first page of results when you Google Doug Bennett; the first entry is for the singer of a band called Doug and the Slugs. Coming up next: The next profile will be Gary Bennett. I have one card of Bob Bennett, from 1993 Front Row. Playing career: Bob Bennett pitched six seasons in the Athletics organization. In 153 games, he went 36-31 with a 4.30 ERA. Where he is now: Bennett was an active member of Native Americans at Dartmouth in his college days. After his playing career, he returned to his South Dakota hometown, becoming a sheriff at the Rosebud Reservation. He then progressed to the Rapid City Police Department and the Federal Bureau of Indian Affairs before landing his current role as an FBI Special Agent in 2003. He mostly handles cases involving healthcare and insurance fraud and civil rights investigations in situations where a police officer kills a crime suspect, but occasionally also works on cases involving bank robbers, kidnappers, fugitives, and terrorism. Google Autocomplete results: He is fourth when you type Bob Ben, between Bob Benson Mad Men, a TV character, and Bob Benjamin, a musician. There are no references to the ballplayer on the first page of results when you Google Bob Bennett; the first entry is for the former Senator from Utah. Coming up next: The next profile will be Doug Bennett. I have 27 cards of Mike Benjamin. This one is from 2001 Topps. Playing career: Mike Benjamin played thirteen seasons in the major leagues as a good-field, no-hit middle infielder (.229 lifetime hitter). Ironically, he is best remembered for getting fourteen hits in three consecutive games, a major league record. From June 11-14, 1995, he got 14 hits in 18 at bats, a .778 batting average. In his other 168 at bats that season, he only got 27 hits – a .160 batting average. My memories: I remember him getting a lot of attention for that hitting streak, and was surprised to look over his stats and realize what a mediocre hitter he actually was. Where he is now: Assistant Coach at Arizona State. Interesting facts: His son, Mike Jr., was drafted by the Rockies in 2013. At Class-A Tri-City he hit .233 with 0 HR and 30 RBI. Google Autocomplete results: He is first when you type Mike Benj, ahead of Mike Benjamin MIT, an ocean engineering research scientist. The first entry when you google Mike Benjamin is not the ballplayer but a wedding musician in Martha’s Vineyard. Coming up next: The next profile will be Bob Bennett. Justin Thomas has pitched professionally since 2005, including time in the major leagues with the Mariners, Pirates, Red Sox and Yankees. He spent last season in the A's organization and will be going to Spring Training in 2014 with the Angels. He kindly answered my questions about baseball cards. "I did collect them as a kid. Griffey rookie is my prized possession. I have a rookie card of me that is my info with Thomas Oldham pictured." Ryan Snare pitched six years of professional baseball in the Reds, Marlins, Rangers, Padres and Royals organizations. He pitched in the major leagues in 2004 for the Rangers. Now Enterprise Sales Manager at Comcast Business in Norcross, GA, he kindly answered my questions about baseball cards. 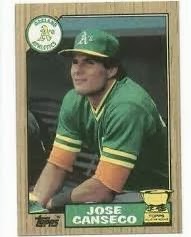 Jose Canseco rookie card. Or any card from the early 90’s, their style was a riot. Yes, I have every complete set of Topps from 1983-1997. I have eleven cards of Yamil Benitez. This one is from 1996 Circa. Playing career: Outfielder Yamil Benitez played for the Expos, Royals and Diamondbacks from 1995 to 1998. In 169 games he hit .243 with 19 HR and 60 RBI. Where he is now: A youth baseball instructor in Puerto Rico. Google Autocomplete results: He is third when you type Yamil B, between Yamil Borges, an actress, and Yamil Bukele, a basketball player in El Salvador. There do not appear to be any other prominent Yamil Benitezes. Coming up next: The next profile will be Mike Benjamin. 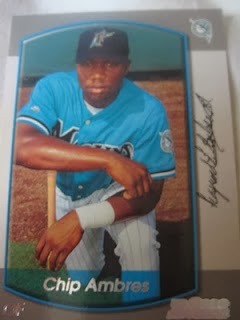 I have 29 cards of Armando Benitez. This one is from 2001 Topps. Playing career: Armando Benitez was one of the top closers of the late 1990s and early 2000s. In fifteen seasons with seven teams, mostly the Orioles and Mets, he saved 289 games, struck out well over a batter an inning and had a 3.13 ERA. Nevertheless, he is remembered for blowing several pennant-race and post-season games, most notably Game 1 of the 2000 World Series against the Yankees. My memories: I remember him very well from the 1998 game where he hit Tino Martinez in the back, leading to a huge bench-clearing brawl. In the late 90’s it was the Orioles, not the Red Sox, who were the Yankees’ big AL East rival, and this brawl was a huge deal. Where he is now: Anyone know where Armando Benitez is now? Google Autocomplete results: He is fifth when you type Armand, between Armand Hammer, who used to run Occidental Petroleum, and Armand Van Helden, a DJ. Another prominent Armando Benitez is a dancer in Paraguay. Coming up next: The next profile will be Yamil Benitez. I have 33 cards of Juan Beniquez. This one is from 1986 Donruss. Playing career: Juan Beniquez came up as a shortstop with the Red Sox in 1971. He struggled with the glove and was sent back down to the major leagues. He returned in 1974 as an outfielder, and was good enough to win a Gold Glove. He became a well-traveled pinch-hitter/fourth-outfielder type who set a record for most American League teams played with – eight. (Red Sox, Rangers, Yankees, Mariners, Angels, Orioles, Royals, Blue Jays) A fuller account of his career can be found at the 1980 Topps blog. My memories: I remember him at the end of his career getting some notoriety for the amount of teams he played for. Where he is now: Anyone know where Juan Beniquez is now? Google Autocomplete results: He is first when you type Juan Ben, ahead of Juan Benson, a model. Another prominent Juan Beniquez is a drug trafficker from upstate New York. Coming up next: The next profile will be Armando Benitez. Infielder John Powers played seven years of professional baseball in the Padres, Cubs and Rangers organizations. In 619 games he hit .270 with 37 HR and 215 RBI. Now a corporate lawyer and owner of Powers Law in Scottsdale, AZ, he kindly answered my questions about baseball cards.
" 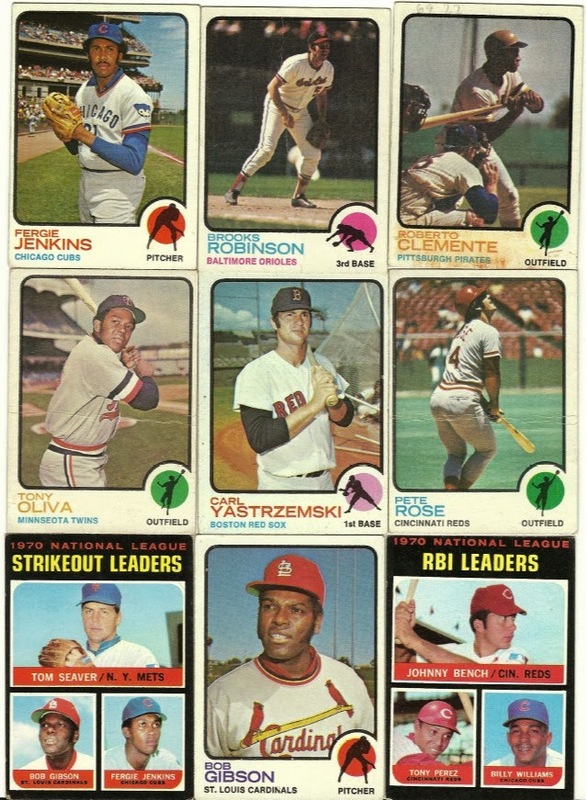 I had baseball cards as a minor leaguer of course, but do have ONE that was nationally printed. It's a 1998 card of SP prospects. That would be my favorite card. The actual photo is of me hitting in a game, and it was my first at-bat in my first game back after missing a few games due to injury. I know that on the swing in the photo, it was an off-speed pitch that was high and away, and I was early, but it was a soft line drive off to left field the end of my bat for a hit. So, I know the exact picture and what happened. Kinda neat. The other cool thing is I went to a D'backs game after the minor league season and some kid walked right up to me and asked for my autograph. I wasn't famous but it felt kinda cool to be recognized! That was also in 1998. I collected cards. 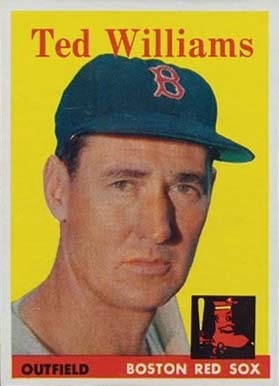 My favorite card would probably be an old Ted Williams card (1958?) in horrible condition. I have a LOT of Mike Greenwell cards, as he was my favorite player growing up."